Quite a lot of 1981’s available. 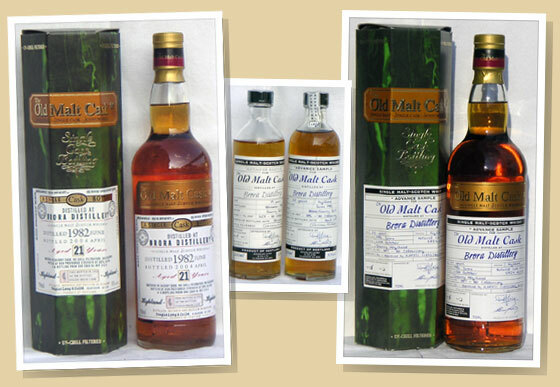 Some lightly peated and smoky ones, like most of the dozen or so Old Malt Casks – but a 21yo 1981/October 2002 /(50.00%, US release, 360 bottles) is heavily peated again, while a 20yo 1981/2001 (50%, 570 bottles) is very Talisker-ish, smoky and peppery. 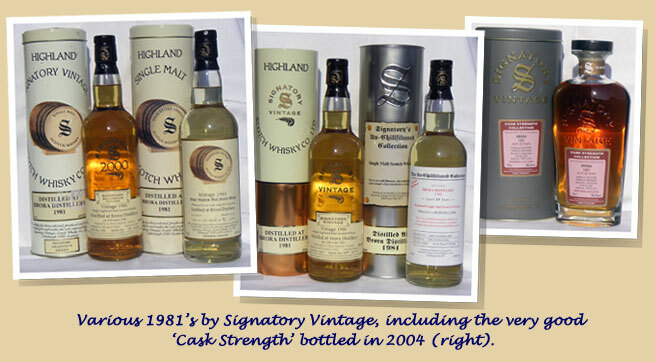 Signatory too issued both a few heavily peated ones, like the 18yo 1981/2000 (43%, sherry, cask 1081), cask 1082 bottled in 2000 or cask #568 bottled for La Maison du Whisky in 1999, and many light, almost Lowlandish ones such as casks #573 to 579. 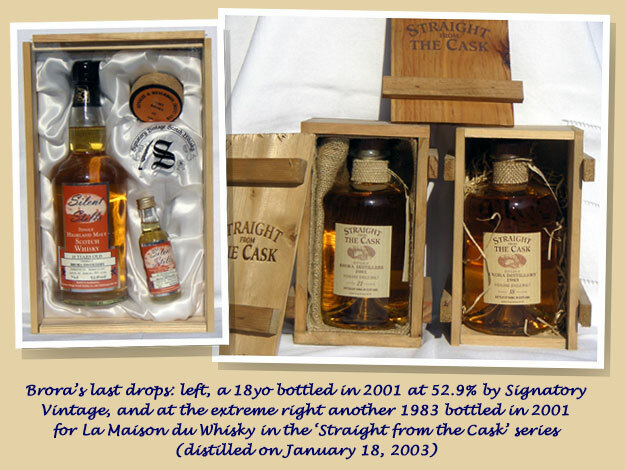 There has also been a few bigger, yet almost peatless ones like cask #1561 bottled by Signatory in 2004 at cask strength. 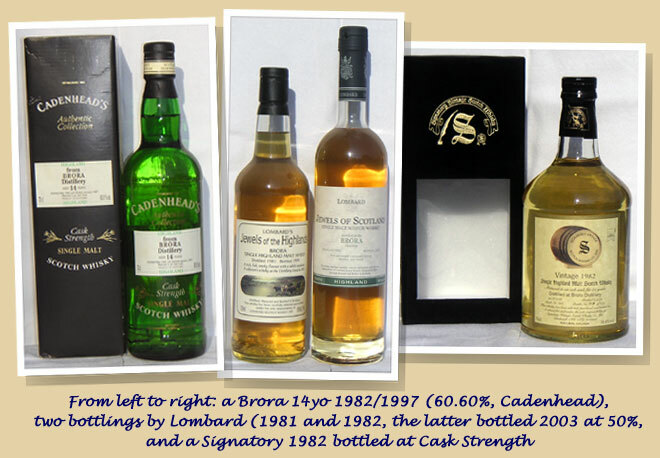 The Scotch Malt Whisky Society issued both some heavily peated ones and some ‘light ones too. #7, 8, 9 and 11 are waxy like a good Clynelish but almost peatless, while #10 is as peaty as an Ardbeg. A bottling by Lombard’s is so-so and virtually un-peated. Duncan Taylor’s 23yo (cask #1426, 261 bottles) has been bottled at the end of 2004 (not tasted yet), while a new very ‘barrock’ bottling by the Japanese ‘Dalriada Whisky Company’ just fetched some high prices at auctions. I’m glad I could get it the cheapest way. A year of massive, but mostly peatless production, it appears – although, again, some bottlings are very smoky. 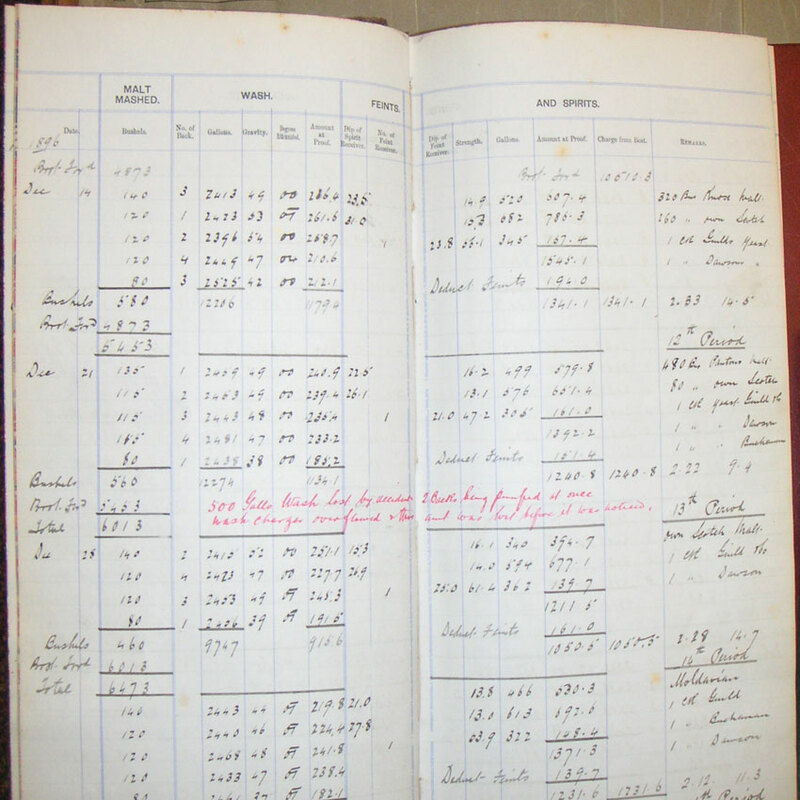 In that year, Brian Spiller writes that both distilleries together occupy a site of approximately 2 hectares, that SMD provides seven houses for distillery employees, and that it still owns Clynelish Farm, which now covers as much as 130 hectares and is let to tenants. Most 1982’s I could taste were almost unpeated and very similar to new Clynelish, even if grassier and more peppery. For instance, a 19yo 1982/November 2001 by Douglas Laing (50%, 744 bottles) is smoky, tary and rubbery like a Port Ellen, while a 20yo1982/April 2003 (50.00%, 354 bottles) is almost unpeated. 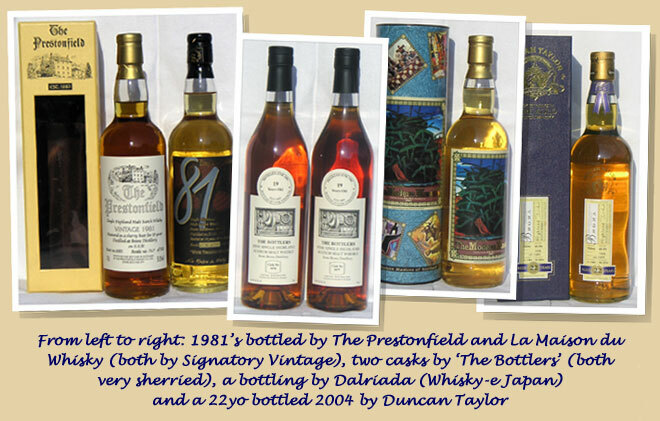 Douglas Laing issued a string of no less than five casks of 1982 within just one year. 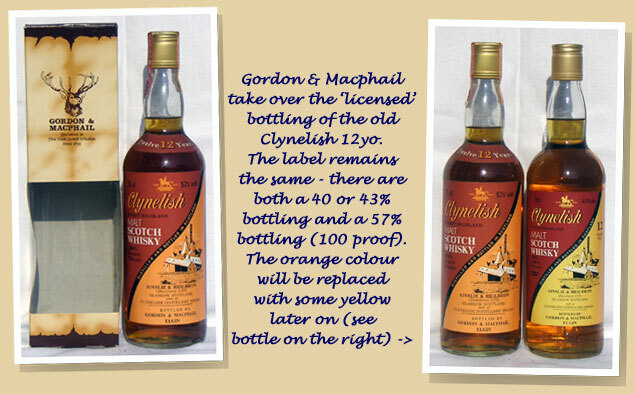 Gordon & MacPhail started to release their 1982’s just after they had no 1972 left, in 1997. Most are okay, even if very lightly peated. 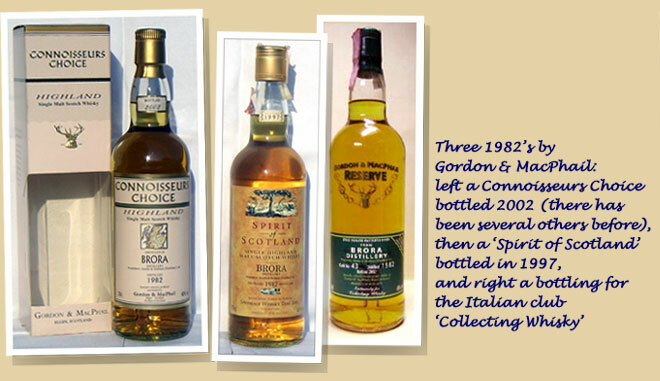 They also bottled some for an Italian Club, Collecting Whisky, or for their ‘Spirit of Scotland’ sub-brand. Diageo’s 20yo 1982/2003 from the Rare Malts series is very good (87 points), subtle, fresh, fruity and waxy like a Clynelish but almost unpeated. Signatory’s cask strength versions are more or less in the same vein, just a little less subtle, while most interestingly, Cadenhead’s only four casks (all released in 1995-1997) were all very smoky and hugely peppery like a Talisker. All the bottlings of 1982 by the Scotch Malt Whisky Society (#16 to 19) are, again, waxy like Clynelish and almost peatless. I rated #18 84 points, for example. There has been a Blackadder issued in 1995 but I never opened it. All versions by Chieftains are heavily sherried and almost un-peated, the one I prefer being the first release (casks #1189 and 1192): 86 points. The Italian bottler Siver Seal had two bottlings too, the first one, released in 2001 being un-peated but excellently sherried (92 points). Lombard’s issued an excellent – and almost un-peated again – 21yo bottled in 2003 that I scored 86 points. There’s also been some rare bottlings such as one by ‘First Cask’ or ‘Preiss Import’, but I could never even see them – except on a picture. Most sadly, Brora is officially mothballed by SMD / DCL, most possibly on March 17th but I’m not quite sure. As a last salvo, the valiant little distillery produces some excellent peated whisky again, as an 18 years old Signatory from the ‘Silent Stills’ series will testify. It smells humus and is much peatier than most 1981’s and 1982’s. Most recommended (88 points). A 18yo bottled in 2003 at 53.40% in Signatory’s Straight From the Cask series, cask 39, 428 bottles, is a little rougher and a bit unbalanced (81 points). Some late rumours claim that Brora was still distilling in 1984 - just some short runs to keep the equipment fit – but I have no evidence.